Birds (and other widlife) are getting tangled in fishing gear and suffering injuries and amputation of feet before dying slowly and painfully. Hooks and fishing line, and even string, can entangle. Tackle bins offer a handy solution for unwanted fishing line and tackle. These specially designed bins keep tackle safely secured and allow it to be disposed of properly, as well as increasing awareness of the need for safe disposal. At Tallebudgera, Ray Ison (a volunteer at many organisations including B4C, BCN and RSPCA) services the boxes and removes the contents to safe landfill. 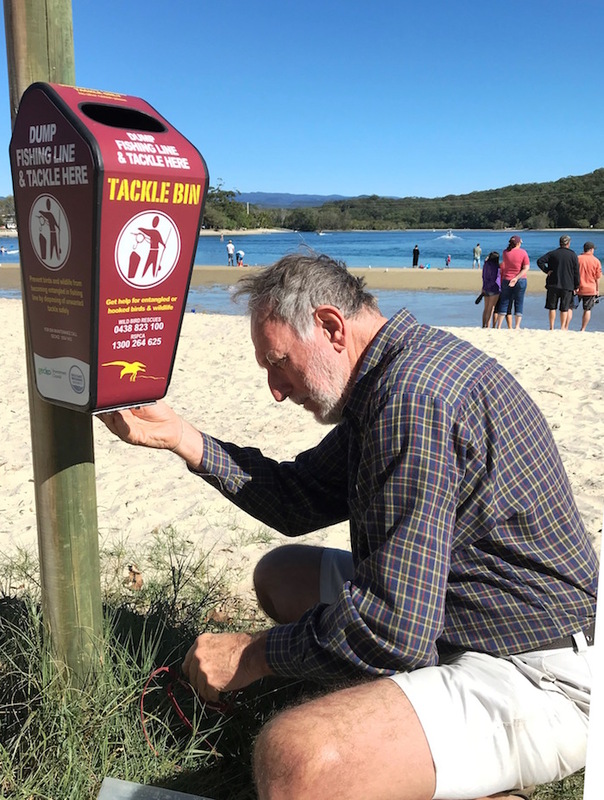 A number of special ‘tackle bins’ have been installed at popular fishing spots around the Gold Coast in an attempt to reduce the amount of fishing line litter around. The scheme is backed by animal carer groups and RSPCA. Are there any on a beach near you? If not get onto your local Council and ask for them. Maybe even volunteer to service them, like Ray. Gold Coast, Ray Ison, tackle bins.